More than two thousand years ago in a small Roman dungeon where he awaited his execution, the Apostle Paul lived and breathed and…what else? What were his conditions, his mood, his thoughts, his actions? 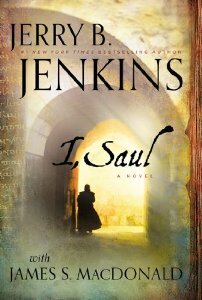 While we can’t know for sure, in I, Saul, Jerry B. Jenkins dares to both explore those questions and create a fictional account of the answers. And he doesn’t stop there. Paul’s historic last days result in modern-day danger for Augustine Knox, a struggling professor who is called upon to help a friend now hunted because of what the Apostle Paul left behind. Coming to his friend’s aid, Augustine doesn’t only jeopardize his career and his own life, but the life of his fiancée as well. What will become of them, and of the priceless Pauline discovery, remains a mystery until the very end. Jenkins has once again gone outside of the box to bring readers a story worth getting excited about. Augustine, equal parts jock and egghead, is an unusually witty character who endears from the beginning, and who really comes to life when he hits Italian soil. Roger Michaels, the friend responsible for Augie’s newfound problems, comes across as the guy everybody wishes they knew. Augie’s fiancée Sofia is also likeable and seems to have a pretty good head on her shoulders, and the romance elements between them remain somewhat surface level so as not to detract from the main focus of the plot. For the story to advance to a position of intense intrigue and high stakes, Jenkins had to build quite a bit of background in the early chapters. As a result, the beginning consists of several flashbacks, which at times made it a slow read. But once the stage is firmly established the story takes off. Imagine a rollercoaster that paces its way to the top, then plunges its rider into an adventure that is both intense and exhilarating. More than that, I, Saul has a message of faith that is piercing to the heart. This surprised me, since at first I found the delivery of the faith topics very simple and straight-forward. Turns out simple + straight-forward + the Word of God = Powerful.